"Thank you, thank you, thank you! The trees you sent to us were fantastic!!! It was a huge blessing to pass the trees out to the Seabees here in Rota, Spain. 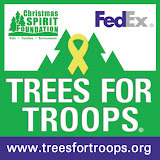 Trees for Troops is an amazing organization to do this. It is folks like Trees for Troops and the tree farms helps us remember what a great nation and a great people we get to serve through the U.S. Navy. The trees were a huge hit and a monster morale boost!" "I recently received one of the beautiful trees at the Ft Eustis Army base. I wanted to say thank you very much, it is a wonderful and heartfelt gesture that outstanding Americans from around our great nation donate to this program and that FedEx delivers to bases all around the USA. We are very grateful for all involved that make this possible." "Thank you to all the hard dedicated contributors and sponsors that help with Trees for Troops. My husband is deployed this Christmas but that did not stop me from putting a Christmas tree up. I was able to receive a beautiful Christmas tree through this program and with my husband away it brought more Christmas cheer to our house." 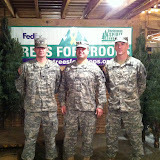 For the most current photos, visit the Trees for Troops Facebook page.